Those of you that have visited The Pop Inn (or my house) know I am a bit of fan of the Rutherglen region. It actually holds a special place in my heart as the first ever winery trip I did with friends – so adult. It was the place I learnt to taste, learnt to ask about wine and really consider what I was drinking. The year was 2007, and during our visit Kevin Rudd won his historic Kevin07 campaign - there was the excitement of a new era in the air. My friend who worked in hospitality at the time had organised a great deal for us – 2 days of wine tasting in a LIMO!! This was not only going to be cool, but also classy – Alas I digress. I try to visit the region every couple of years to see what is new and visit old favourites. So, after Christmas, I made the journey down with my family to explore again. We certainly picked a hot time to go – 40 plus degrees every single day! For our first night, my sister had cleverly booked ahead for our dinner at Thousand Pound. We had some time to kill so decided to wander the main street and see what was about. We stumbled across the charming James & Co. Cellar Door / Bar. This place was an absolute treat. Crisp Sangiovese Rosé from James & Co. Greeted warmly by Ricky, he welcomed us up to the bar to sample the wines. The wines are from Beechworth and his specialty is Sangiovese. Both Ricky and his wife live in, and love Rutherglen so decided to have their cellar door in the main street. We had a delightful, dry rosé, Sangiovese Cabernet and straight Sangiovese. We also sampled a light, aperitif style sparkling rosé. It was my first visit to James & Co but I can certainly say it won’t be my last. That night we dined at Thousand Pound – also found on the main street. The food was amazing and the service impeccable. We had a good laugh with the staff, enjoyed some great wine and enjoyed it so much, we went back on our last night of the trip. The next day we started at the Pickled Sisters for brunch and enjoyed a tasting at the Cofield Cellar Door on site. Next stop was Anderson Winery who specialise is some interesting varieties like Petit Verdot, but are most well known for their sparkling’s. Their vintage Sparkling Shiraz is a must try. The next stop was Scion Wine. This is definitely a favourite of mine (and many of my friends and family now too!). Scion make small-batch, premium wines focussed on complexity and elegance. They eschew the traditional, big heavy styles of the region to make wines that are more refined and pair excellently with food. The Rosé is always a favourite, as is the Durif Viognier and their fortified wines. Last stop for the day was to visit our friends at Valhalla Wines, where we got to indulge in a generous cheese and charcuterie board while playing tracks from the extensive vinyl collection! The Ranga is a highlight of the Valhalla range but we also very much enjoyed the Pinot Noir and Tempranillo. The whites at Valhalla are crisp and refreshing which was great for a hot day! That evening, we dined in a less than glamorous local pub and finished the night with a bottle of champagne back at our digs where we philosophised about the state of the world. Our second day we had scheduled lunch at the hatted Terrace Restaurant at All Saints Estate. We enjoyed a brief tasting before taking our seats in the stylish restaurant surrounded by gorgeous views of the estate and vineyard. The meal was amazing (as was the company). All Saints Estate houses The Terrace restaurant - an exquisite dining experience. Our afternoon was spent exploring the impressive collection of indigenous art at Rutherglen Estate before we had to take my sister to Albury to catch her train back to Melbourne. I can’t recommend a visit to Rutherglen highly enough. 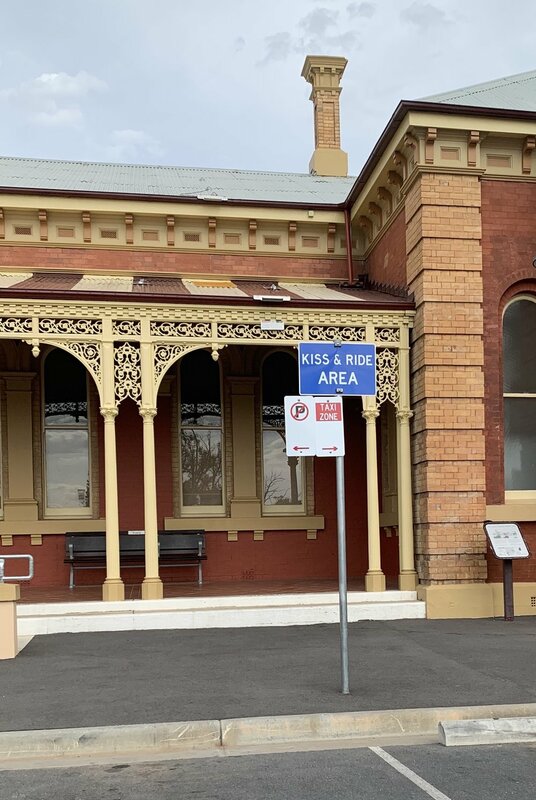 It may not have the touristy finesse of regions like the Hunter or Barossa Valleys, but there is a rustic authenticity to the wines and food of Rutherglen. The scene is sophisticated, and there is a genuine focus on high quality, local produce. If you are planning a visit, the Tastes of Rutherglen Festival is on 9-10 March 2019. Food matches, masterclasses and entertainment are all on offer so it is a lively time to get acquainted with the region.